What a GREAT meetup tonight! We had four DeLoreans and six owners, as well as a few spouses and kids and friends! In all I counted 12 people! So far, the most successful “Dinner with the D’s” yet! And a HUGE thank you to everyone who came out – even those without DeLoreans! I think everyone had a great time eating their In-N-Out Burgers and getting to know each other! It turned out to be bit chilly just as the sun went down, but then it leveled off and it was comfortable. Although this was NOT a good location choice, due to the high parking lot traffic and inability to park the DeLoreans close together, it still worked out fine. There were plenty of people taking photos of the cars and asking questions, and more importantly, there were several brand new DeLorean owners getting lots of input from those who had owned their cars for a little while. 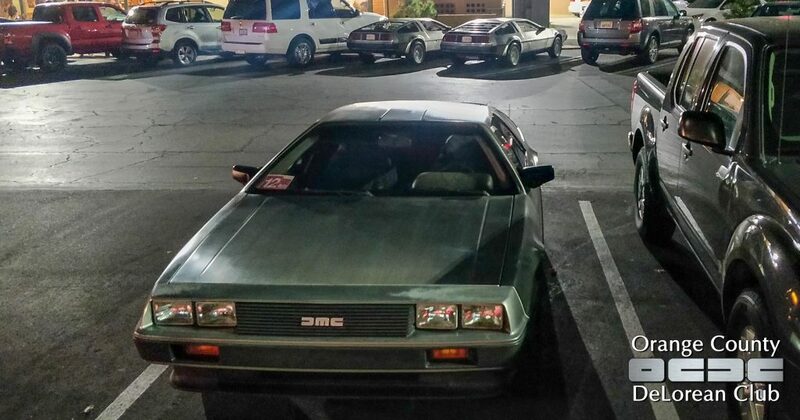 While David and Becca aren’t really “new” owners, David recently liberated his DeLorean from his father in the past few months, and has just gotten it drivable again for the first time since about 2007. Todd has had his DeLorean since about July, and this is his second “Dinner with the D’s”, and third event with the Orange County DeLorean Club. And Tim just purchased his car, but it’s at the shop getting the standard engine restoration that our cars need when they’ve sat neglected for many years. But it sounds like he too will be a regular part of our fledgling group of DeLorean owners here in beautiful Orange County, California. Several of OCDC owners will be heading to DeLorean Weekend Las Vegas in a couple of weekends, then we’ll have another “Dinner with the D’s” in October, just before our (hopefully annual) “OCDC Fall Drive.” The more the merrier!